We haven’t done a lot of diving this year, but at least in November we’re going all out again. We’ll be traveling to Papua New Guinea to dive the Eastern Fields area. This isn’t a regular destination due to the conditions, but we’re hoping for the best. We’re joining Eric Cheng and Tony Wu for 2 trips on the Golden Dawn, a boat we’ve seen before near Kimbe in PNG. After that month we’ll be back in Amsterdam for the holidays and then off again to visit Julie’s mother in the Virgin Islands. In may of 2009 we went to Indonesia with Eric Cheng for a total of 45 days. We did over 130 dives, and went from Lembeh to Raja Ampat, Halmahera, Ambon and finally Flores. It was one of the best trips we’ve ever done, with a really nice group of people. It took a few months, but I finally managed to upload a gallery of the images. You can also read our tripreport. For about 2 years now I’ve been using Smugmug for parts of our website. The people running Smugmug remind me of my own company and the way it started more than 15 years ago. A close nit group of people with a real passion for what they’re doing. I recently noticed they now allow you to embed slideshows of galleries in any website that accepts them so I thought I’d give it a go and embed a sampling of our underwater photos. In the not too distant future I also hope to replace most of our current Gallery2 based galleries with Smugmug galleries. Julie and I just returned from a 45 day dive trip in Indonesia. This is pretty long even for us. We did 40 consecutive days of diving, and did well over 100 dives in total. 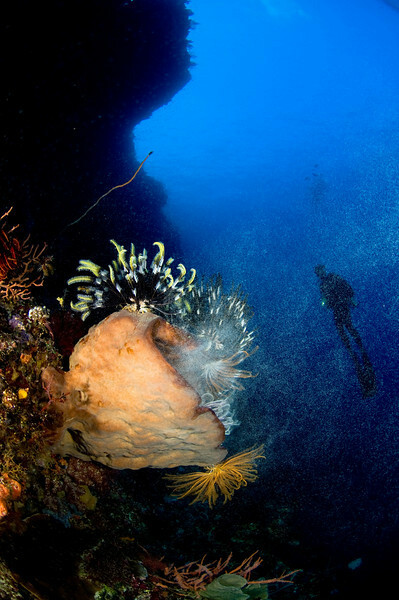 The trip took us from Lembeh in North Sulawesi to North-West Papua, Raja Ampat, Halmahera, Ambon, Banda, Alor and Flores. We saw many things we’d never seen before, including Harlequin Shrimps, Flamboyant Cuttlefish, mating Cuttlefish, and much more. We had great company, including fellow Wetpixel Administrators Eric Cheng, Matt Segal and Craig Jones. We’ll soon have a gallery online, but until then read our tripreport which includes some of our images. For dutch photographers Cor is doing a talk about this trip on the next AquaShot evening on April 17. It’s always a bit exciting when you get something published for the first time. I just saw the latest issue of Sport Diver magazine at our regular dive shop Cane Bay Dive Shop with two of my images in it. Sport Diver regularly does an image callout to a selection of underwater photographers, and we joined this list a few months ago after they invited. When they asked for some images of St Croix I submitted some, and included some from other places as well. They printed two of my images. Very cool. I hope this will not be the last, as I must admit that Sport Diver pays very well for a dive magazine. Here’s the two images. One is a Lemon Shark from the Bahamas. The other a Frog Fish at the St Croix pier. About a year and a half ago Julie and I did a long trip in the Banda Sea. This is when the idea for another trip to Indonesia grew. Eric was thinking about doing a similar trip, from Northen Papua through Ambon towards Flores. We immediately agreed to join this trip, which eventually turned into a double trip. He also arranged for a well known guide named Graham Abbott. So we’ll be heading back to Indonesia for a full month on the Seven Seas liveaboard. Since we’re in the area anyways, we also decided to take a small group into Lembeh, a well known diving mecca that both Eric and us have never been to. It’s a macro heaven, with black sand bottoms and some of the most amazing macro around. And to top it off, Julie and I will spend a few days in Singapore before the main trip, to acclimatize to the time zone change and catch up with some diving friends. We can’t wait to start this trip. It promises to be a very rewarding trip and we expect a lot of good photographs. It’s also going to be great to see all our old friends again, as almost everyone on board will be someone we’ve already been diving with. A few weeks ago we were contacted by Brendan O’Brien asking if we’d like to write a little piece about how we entered the world of photojournalism. Of course my immediately answer was “But we’re not photo journalists!”. According to him we are, and I suppose you can argue either way. We have been published in several magazines, we have had several covers, and the whole field of photojournalism is undergoing a major change anyways. What used to be a very closed community has now changed to a world wide arena of bloggers and other online writers. I quite like Brendan’s blog. It’s got a lot of interesting information for new writers and photographers. Information that is hard to come by if you don’t know how this world operates. I highly recommend it for anyone that’s interested in getting published. Read Our Story on Brendan’s blog. I wrote a small article about how to photograph mating hamlets for DuikenInBeeld, an online magazine. It was the first time we ever tried shooting hamlets, even though they were right under our noses for years in the Virgin Islands where we stay every winter. Read the rest, with some pretty sad events, in our tripreport. You never know what to expect when you dive. During a dive in Indonesia I suddenly saw a sponge spawning. The event only lasted for a few minutes, but I was able to capture some images. It was the first time I ever saw this with my own eyes. It’s always nice to win a prize in a competition. We don’t enter that many, actually only two this year, but you always hope one of your images will do well. One of the honors I hadn’t received yet was a Best of Show, until now. I got the BoS at the Underwater Images competition. The image is of a Lizardfish being cleaned by a small goby taken in the US Virgin Islands. It was a coincidence that I even took the image. We had entered the water to take photos of mating hamlets at dusk. On our way to the spot where we had seen Hamlets we crossed some coral heads, and on one of them I noticed a Lizardfish with its mouth open. At first I figured I was too late, but as I got closer it just stayed there. For the next 15 minutes the goby kept coming back to clean this Lizardfish, and I got quite a few shots. Eventually it became too dark and I stopped, but it was a very cool experience. At wetpixel.com, where I am a co-admin, there is a weekly contest called ‘Photo of the Week‘. Every wetpixel community member can upload some images, and everyone can vote for the winner. This is producing some incredible photo’s, and over the year a set of images that can rival almost anything out there. To increase the exposure of these images I have created a Facebook application called ‘Underwater Photo Of The Week’. It lets you add the POTW to your profile, and lets you see all the previous winners.Â Now potentially millions of people can see these amazing photo’s straight from Facebook. I’ve also made a WordPress widget, which allows people running WordPress to add the POTW to their blog. You can see that in action in our own journal. In the last few years, images of mating Hamlets have turned up in several publications. Julie and I love watching natural behavior, but we’ve never really taken the time to go out and photograph Hamlets. St Croix is actually a very good place to do this, as there are different species of Hamlets here, and lots of them. So we finally went out last night to see what all the hubhub is about. We didn’t really know what to expect. We’ve photographed mating behavior of other species before, and some species, like for instances Dragonets can be really difficult to approach. So we were ready to stalk our prey and stop breathing. None of this turned out to be necessary. The Hamlets were completely oblivious to our presence and at times would actually swim within two feet of us by themselves. Their mating session lasted for about 30 minutes, during which they went up into the water column about a dozen times to mate. It was quite interesting to watch. So here it is, my very first image, shot when they went up the first time. All content copyright Cor Bosman/Julie Edwards | Page loaded in 1.525 seconds.